When you are in a position of needing special care in the hospital, nursing home, or even in your own home, there are certain items that you simply can’t do without. Even in the case of being the primary caregiver to a loved one who is seriously injured or suffering from a severe illness or disease, medical supplies become very important aspects of your life in a hurry. 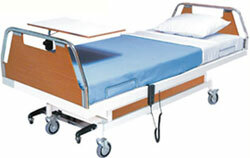 One of the biggest things that any home needs when it has a medical patient in it is an adjustable hospital bed. Naturally, you can find these easily in the hospital, nursing home, or rehabilitation center, but most people don’t have this type of furniture just lying around in most cases. Luckily it’s pretty simple to choose the type of adjustable hospital bed that will best serve your or your loved one’s needs. Take a look at some of the most commonly chosen adjustable hospital beds for a starting point in your quest for the right bed.